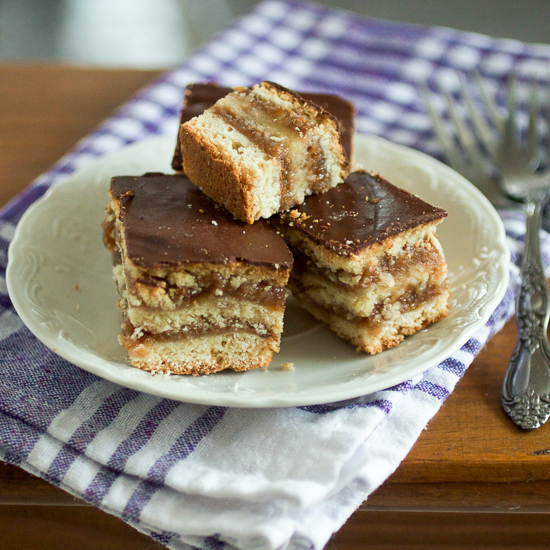 Chocolate and preserve squares are the most delicious cake-like dessert you’ll make this year. Just when you think you can’t take anymore chocolate, you feel the smoothness of apricot preserve that’ll keep you coming back for more. 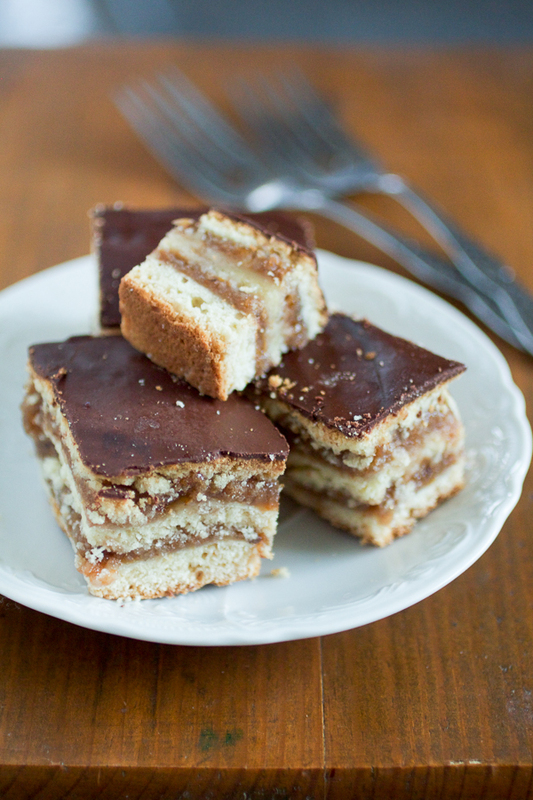 Chocolate and preserve squares are little complicated of a dessert, but well worth the effort. This dessert consists of three layers of dough in between which is a filling made with preserves – in our case apricot or plum, but you’re welcome to go ahead and try others, my only recommendation is to go for thicker ones – mixed with walnuts. This is then baked, and finally, glazed with chocolate icing. Heaven! The complicated part is the dough (which becomes the crust). When butter, few other ingredients plus flour combine – result is a sticky, play-doh kind of dough that’s difficult to maneuver. Luckily, the recipe doesn’t require too much dough work, so don’t let this scare you away. I am just mentioning it in case you start wondering why the dough is a bit hard to work with. If you do your logistics well – which includes reading the steps a couple of times ahead of starting – you should be fine. The result will be magnificent, so I urge you to try making these squares at least once because you’ll be hooked. And each consecutive time it’ll get easier. 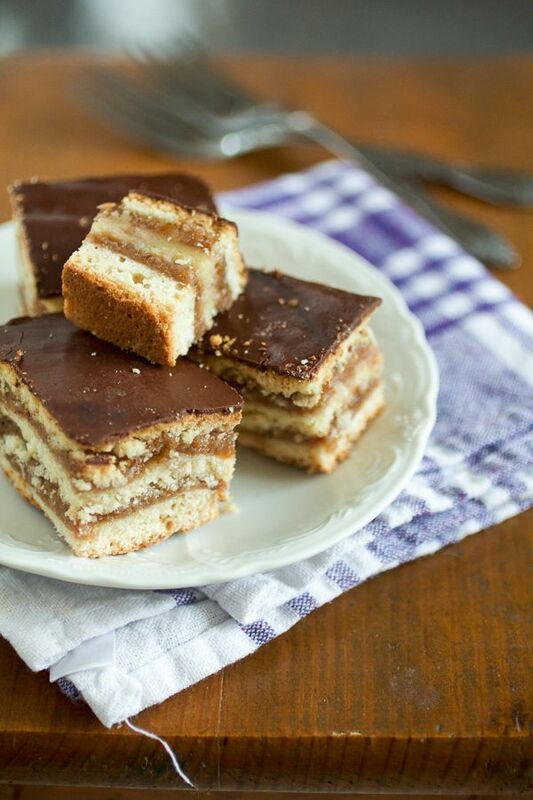 Žerbo šnite was my grandmother’s specialty. She didn’t make it often, but I distinctly remember she made them each time we came from the beach. When I was a kid, my mom, dad, sister, brother and I went to the Adriatic each summer for vacation. We started each trip late at night, after mom and dad packed our blue Lada up to the brink. They dragged us to the car, where the three of us continued to sleep through most of the ride through Herzegovina. I remember waking up just as I smelled the Adriatic. A few mountains over, and we were at the beach. This was during the period when dad was obsessed with tents, so he’d drive us up to a camping ground in one of those little Dalmatian towns, each one as charming as the next one over, where the complicated part of setting up the tent commenced. I was still relatively young, so I was free of those responsibilities. But I too had to suffer having to wait until the tent was up to dip my feet in emerald green Adriatic. Since beach time had to wait, I usually ran around campgrounds and chatted with people. During the time it took the four of them to set everything up, I already knew everyone. And most of them found out from me that dad was a doctor, we were from Sarajevo, there were five of us, and which tent we were in. In turn, I found out who was from where, which vacationers had a speed boat, and how long everyone was staying. Apparently, the little me left no subject unturned. Although (like everyone except dad), I wished we had stayed at an apartment while at the beach, I had to agree the tent was magnificent. It was bright yellow, and imposing. Inside, there were two smaller tents: one for us kids, and the second one for mom and dad. There was also enough tent left for a “living room” area. It was so large, a sheik from somewhere would’ve found it comfortable enough. Dad used to drive us insane finding just the perfect spot, until he’d find one under the intoxicating pine trees with a private view of the sea. Around the time I realized how great the tent was, came the moment to go to the beach. I’d run way in front of everyone, in small plastic shoes not unlike the Crocks of today. I sped through all the tiny roads on the way to the rocky beach. I ran into the sea and screamed with delight until water reached my shoulders, and then I’d wait for the rest of them to arrive. I didn’t know how to swim yet. We had a grand old time each time. There was a routine we acquired. Mom prepared food, dad attempted to fish. Brother flirted with the girls from Czechoslovakia, and sister had an amount of books that could equip a smaller library. And me, I was still learning how to swim, a task I wouldn’t learn until I went to the beach with the scouts some years later. At night there were remi tournaments and sounds of the guitar, and deep midnight blue sky sprinkled generously with small, bright stars. Each year we rubbed olive oil on ourselves instead of sunscreen, until our skin became deeply sun-kissed. But before it reached that shade we got majorly sunburned – all five of us – and spent the first few nights splashing yogurt on our bodies trying to cool down the burns. We always met people from all over the place, and before long we shared our food together, went to the beach together, and soon enough found out our seven degrees of separation. It was a small cosmos, that Dalmatia, you could always find someone you knew through someone, and someone you liked. Unfortunately, vacation days at the beach passed quicker than the days in the city. Before long, the tent would be taken down, we’d be saying goodbye to all the new friends we made, and pack up Lada even tighter than before. We spent each last day splashing, trying to take in as much sun and the sea as we could, for there was another whole year until we’d be there again. We started the trip back early in the day so we could make it to Sarajevo just before the afternoon turned into the night. Somehow we stayed awake all the way to the city. And we went straight to grandma’s place for dinner. Each time she waited for us on her balcony which was lined up with all sorts of flowers. In the kitchen, next to the dinner, always was a big pan of Žerbo Šnite. These chocolate and preserve squares brought the end of the summer, and with the same vigor started off the new fall. P.S. 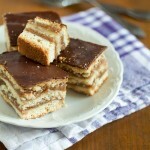 For a couple of simpler recipes, but equally as good, check out the Balkan lamingtons or chocolate squares. Dough: Start by making the yeast mix: combine 1 tbsp of sugar, 1 tbsp of flour, yeast, and 3.5 ounces of milk. Leave aside for 10 minutes. The yeast will bubble up and rise. 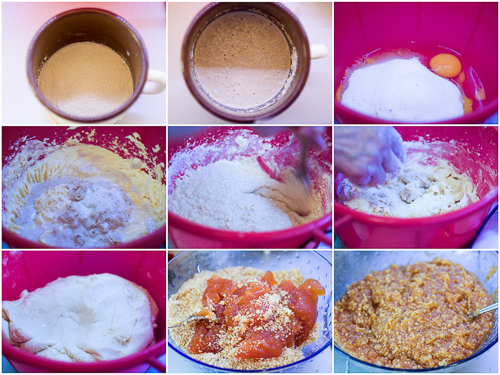 Combine the remaining sugar, eggs, butter, a pinch of salt, and a pinch of baking soda to the yeast. Mix well. Add the yeast. Continue mixing. Add the flour in slowly, and stir everything with a flat ladle for as long as the thickness will allow. When it becomes too thick, start mixing with your hands, and add rum. The dough should be well blended, smooth, and thick. Leave aside for 45 minutes. Filling: Grind walnuts. Combine with sugar and apricot preserve. Stir well. Heat oven to 390F. 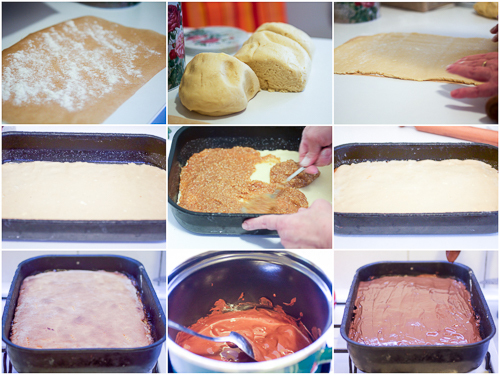 Take a 12×16 inch rectangular pan, and cut a piece of baking paper of the same size. Dust with flour. Divide the dough into three equal parts. Work the first dough ball a little more, and then roll it out on the baking paper so that it matches its size. (This part is challenging as the dough is sticky and hard to maneuver. Do the best you can.) Transfer the dough together with the baking paper into the pan. Take one half of the filling and spread evenly over the dough. Repeat step 6 for the second dough ball (minus the baking paper). Top it with the second half of the filling. Finally, roll out the third dough ball and place on top. Take a toothpick and make thirty or forty small pinches on top of the dessert. Place in the oven. Bake for 30 minutes. Icing: A few minutes before the dessert is finished baking, break the dark chocolate into chunks and melt it together with oil on medium low. Lower the temperature if it melts too quickly. Take the dessert out of the oven. Spread the icing over it evenly. Leave to cool for a couple of hours. Before serving cut into 3-inch squares. Keep in the fridge or a cool place for up to a few days. Please note there is a 45 min waiting period between preparing and baking the dessert. Baking paper and a 12×16 inch rectangular pan are needed for the recipe. I cannot thank you enough for this recipe, which I have been searching for a number of years. My grandmother was born in Split and she and my mother used to make these cookies every Christmas. Needless to say, no written recipe so nothing but memories until now. 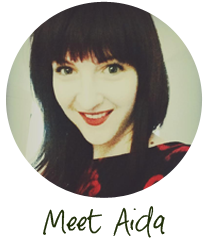 Found your blog today and am enjoying your stories and recipes. I will be a regular reader. PS All four of my grandparents immigrated to the United States from Croatia. Welcome! How lovely that you want to resume family traditions. Croatia is beautiful, I hope you had a chance to visit and explore. These squares are delicious, but they do take a little bit of patience. The result is well worth it.